AFC Fylde bowed out of a second cup competition in five days when they lost their first-round tie in the Buildbase FA Trophy on penalties at Chester after a 2-2 draw. Serhat Tasdemir forced extra-time when he cancelled out Ross Hannah’s opener and Danny Rowe gave the Coasters the lead. However, Chester were level three minutes later and won the shootout 5-4. Manager Dave Challinor made a host of changes from the side that so nearly stunned Wigan in the FA Cup last Tuesday, with Rhys Taylor given an opportunity in goal. At a drizzly Swansway Chester Stadium, where the sides had drawn 1-1 in the opening week of the season, Chester made the brighter start as James Akintunde shot underneath Taylor but narowly wide from the edge of the area. The first real chance for the visitors fell to Matt Blinkhorn, whose powerful header form Jordan Richards’ right-wing cross flew just over. Taylor was the first keeper to be tested on 25 minutes, tipping over Hannah’s vicious 20-yard drive. At the other end, Blues keeper Sam Hornby had to scamper along his goal- line to prevent Richards' free-kick finding the top corner. Richards was providing a real threat for the visitors and his low ball across the area was lashed goalwards by Andy Mangan but deflected wide. From the corner, Blinkhorn clipped an effort wide. The match came to life shortly before half-time. Frontman Hannah was played clean through by Tom Shaw and neatly rounded Taylor before sliding the ball into an open goal. After a lengthy stoppage in play for a Blinkhorn head injury, Hannah was again sent away but this time Taylor cleared the danger. The visitors were knocking on the door in the second half as a corner reached Simon Grand, but the defender couldn't repeat his midweek equaliser at Wigan as his back-post header was comfortably saved by Hornby. The hosts should have had a second with 20 minutes to go, when Hannah intercepted a loose pass from Jason Taylor and slipped in Akintunde but his low shot was smothered by Taylor. Fylde's attacking substitutes Jonny Smith, Danny Rowe and Serhat Tasdemir couldn't carve the Chester defence open as the clock ticked down, though Tasdemir did see a strike deflected over. 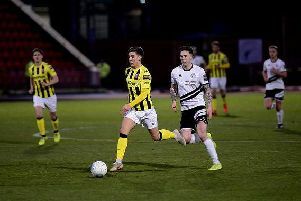 However, there was a last-minute twist as Rowe played Tasdemir in on the edge of the box and the 17-year-old emphatically fired past Hornby. There was still time for Chester to seal victory in the final seconds, when Hannah's free-kick was blocked into the path of Reece Hall-Johnson but his low effort was cleared off the line by Rowe. And Rowe scored his customary goal at the other end five minutes into extra-time, burying the ball in the bottom corner after Hornby fumbled Smith's cross. The hosts were soon level as Taylor saved well from substitute Daniel Udoh only for Lusas Dawson to stroke home the rebound. In the second period of extra-time, Tasdemir should have scored his second when again played in cleverly by Rowe but this time he fired straight at Hornby. Extra-time was proving far more of a spectacle than the previous 90 minutes and defender Luke Burke rescued Fylde with a fine tackle when Hannah went clean through. Rowe, Richards, Tasdemir and McCready all converted penalties for Fylde, but when Smith blasted over the bar Andy Halls won it for Chester. AFC Fylde: R. Taylor, Richards, Burke, Grand, Edmundson, Ezewele, J. Taylor, McCready, Mangan (Tasdemir 71), Muldoon (Rowe 76), Blinkhorn (Smith 65); not used: Tunnicliffe, Montrose. Chester: Hornby, James, Astles, Hannah, Dawson, Jones, Akintunde (Udoh 82), Shaw (Turnbull 76), Hall-Johnson, Gough (Halls 57), Anderson; Lynch, Mahon; Subs not used: Lynch, Mahon.